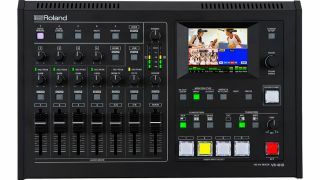 Roland has released a free firmware and software upgrade for its VR-4HD AV and Streaming Switcher. The Version 1.5 firmware update supports capturing a still image from the VR-4HD RCS software for Windows or Mac, plus support for 1/3-size PinP window in addition to the 1/2 and 1/4 sizes currently available. The combination of the new RCS software and firmware updates for the Roland VR-4HD adds titling creation, image capture, and keying capabilities for live production and streaming. The new RCS Software 1.5 for Win/Mac features new titling creation software with graphic import, sizing, and text generation that can be created on a keyed background color and exported to a Roland VR-4HD video switcher running version 1.5 firmware. The image, graphic, or combination is captured on the VR-4HD’s newly added STILL function in the VR-4HD. “The VR-4HD is a powerful live production tool, which now includes the ability to create logos, graphics, or text as a key source using the intuitive and easy-to-use titling software,” said Christian Delfino, Roland vice president of product management, pro AV/dance and DJ/synthesizers. The new drivers can be downloaded here.